For the last two years, I've been fortunate to stay with Dan at Palms for his annual Las Vegas trade show. I've actually accompanied him to Vegas for this show every year from the first year that we started dating, but these last two years we stayed at Palms, a hotel that neither of us had stayed previously. In 2017, we were living in Oregon and quite frankly, really tired of the endless gloomy weather. Dan works so hard at the trade show, that he never gets time to relax. It's a holiday for me and a lot of long hours of hard work for him. I don't spend any time with him during the show. I'm just along to take care of his ironing! In 2017, we had planned to arrive the weekend prior to the show and have pool time together. Unfortunately, we messed up the booking and arrived late on a Friday evening to realize that we didn't have a place to stay. Vegas has so many hotel rooms, that you'd think we'd have an easy time finding alternative accommodations. We drove around for hours, calling ever single hotel that we could think of, both on and off the strip. Most were booked solid. A few had rooms that were going for a few thousand a night. Yikes! We were exhausted and discouraged. Giving up, we decided to just drive to our home in Big Bear Lake, about three hours away. We got to Jean, Nevada and decided to just check if Gold Strike had rooms available. I don't think that Gold Strike is a hotel that anyone actively seeks out. It's old, smoky, run-down...but it had rooms. It had a few rooms at a great mark-up. Exhausted, we took a room. As we were getting our keys, a tour bus pulled up and determined that the rooms were too expensive, so they would carrying on to Vegas. We tried to warn them that they would not find a better deal, but they didn't listen. I felt bad, because it was a group of senior citizens. Our room was nothing special, but it was clean and it had a bed. In the morning, we got to see our view. The window could use a clean. We were determined to use the pool. When we asked a security guard for directions to the pool, he responded that he didn't know that the hotel had one. He wrangled an older security guard, who knew where the pool was located, but couldn't imagine anyone who would use it. It was next to the loading dock and had the vibe of a pool that you'd find at a scummy apartment complex. It had a few broken lounge chairs. But we were so sun deprived from the PNW, that we were happy. Gold Strike has a Denny's and a small quick-serve food kiosk. After our trauma of trying to find a hotel, the first thing we did after dumping off our luggage, was head back down to the casino for a drink. It was about 3am. There was one bartender that was also working the casino floor as a cocktail waitress. It wasn't exactly bustling, but she could have definitely used some back-up. I'm grateful that we were able to get a room at Gold Strike. Other than sleeping and using the pool for a few hours, we just drove into Vegas for movies and food that weekend. It wasn't the weekend that we had envisioned. I wouldn't likely stay at Gold Strike on a future trip, unless we were desperate, but I have to say that every employee went out of their way to be kind and helpful. A wonderful group of people work at Gold Strike, which adds value to the hotel. They also have funny, low-budget signs in the elevator. And a car museum! We actually stopped here with Felix when he visited us during Christmas. A car museum and Denny's is pretty much the definition of heaven for an eight-year old. 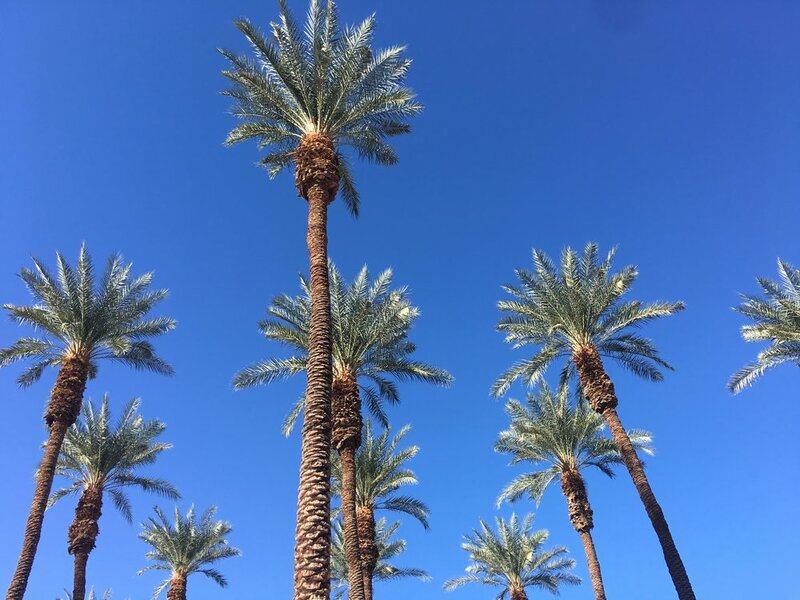 Our experiences at Palms in 2017 and 2018 were very different, primarily, because during the second stay, the hotel was in the middle of 485 million dollar renovation. 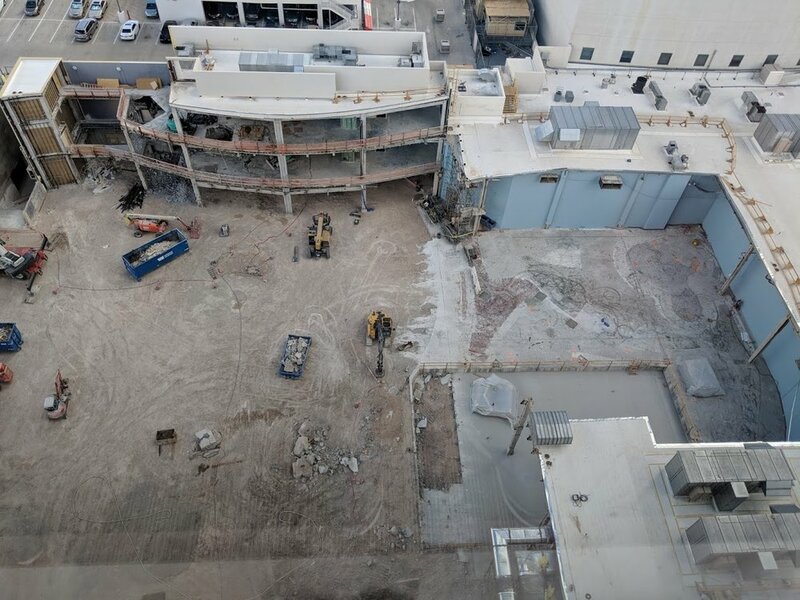 I'm sure that it will be stunning when the renovation is complete, but 2018 is not the year to stay at Palms. The rooms are contemporary in style and thoughtfully designed. On our first stay, we were given a standard room with two queen beds. The room had a view of the front of the hotel, including of the nearby Rio. Our recent trip, we were given a much larger corner room with a king bed and strip views. In 2017, I enjoyed the pool at Palms. So many people are in Vegas for the trade show, that the pools are virtually empty during the day. On a previous trip, I was the only person using the pool at The Palazzo and I was able to swim laps. It was surreal. At Palms, there was just a handful of people in the giant pool complex. I was a little put-off by the strict security, which was gruff and would not allow me to bring a closed bottle of water into the pool area. However, I made friends with the bartender, who gave me two, very strong, Mai Tais for the price of one. Here's some tipsy pictures from the Palms pool complex. And in 2018, the view of the same pool complex from our room. While the pool is being renovated ( I heard that it won't be ready until summer 2019), Palms guests can use the pool at Palms Place. Palms Place is located just a ten minute walk through the casino and a sky bridge. It's a nice pool area, but small and it has a lot of shade. I was only able to use it one time for about fifteen minutes. We had high winds during our visit and the pool was closed for safety issues on most of the days of our stay. The winds were scary and although I was disappointed, I understood. The lounge chairs were flying around! I can't imagine staying at Palms this summer, as there is no way that the pool at Palms Place can hold everyone. It's so small and intimate. I like the food court at Palms, which includes two of my favorites: Earl of Sandwich and Coffee Bean. Chronic Tacos is also delicious. A recent addition to the hotel is the Lucky Penny, Palm's answer to a twenty-four hour diner. 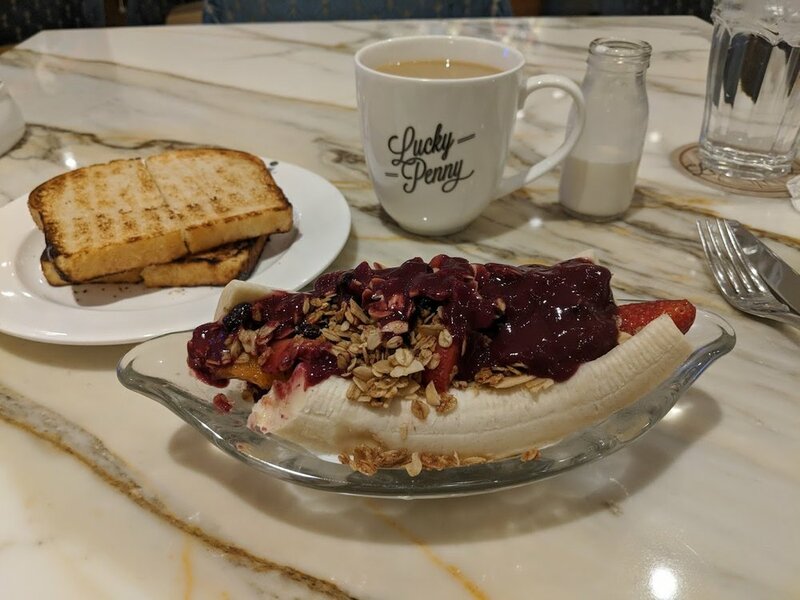 I ate breakfast at Lucky Penny every morning and had the same thing: coffee, sourdough toast, and the AMAZING banana-split parfait. I've been craving the banana-split parfait. It's heavenly. I also love the name of the restaurant, as my mom's name was Penny. My mom would always look for shiny pennies and use them to sign her name in greeting cards. Every time I visit her grave, I see that people have left her pennies. One of my favorite parts of Palms is the Brennan Theatres. As those reading my movie reviews already know, my experience at Brennan Theatres was hit and miss. It was a big miss on five-dollar ticket Mondays, when all of the locals came out. However, I was happy to have a movie theatre right in our hotel, especially when the pool was closed. Going to movies is one of my all-time favorite activities and if we hadn't been staying at Palms, I would have driven to the AMC at the Town Square mall to get my cinema fix. Dan and I both agree that we wouldn't go out of our way to stay at Palms. It's a good, mid-range hotel, but its off-strip location makes it inconvenient. I'm sure that it will be much nicer when the renovations are complete. If his company puts us up here next year, I'll be interested to see how much the property has changed. Our wedding anniversary falls on November 2nd, which always seems to prove difficult as far as planning a weekend trip to celebrate. It's a very busy time of the year and the weather doesn't always cooperate. This year, we had originally planned a weekend at a resort in Huntington Beach to celebrate our 4th anniversary. However, as it grew closer to the date, the weather was looking increasingly bleak. I love the beach, but I often find California beaches to be too cold to enjoy, even in the summer. On the Friday evening on the weekend before we were set to stay in Huntington Beach, we switched things up. 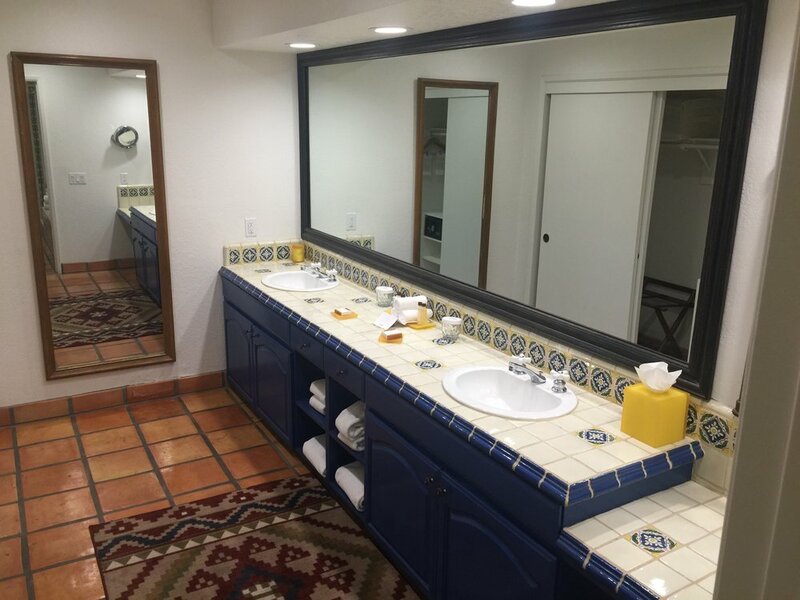 We booked a last minute casita at the La Quinta Resort & Club in Palm Desert. The weather was set to be in the nineties, which is pool perfect for us. We took backroads and arrived shortly before eleven. Celebratory drinks were in order, so we had bell services hold our luggage as we headed to the outdoor patio bar at the Adobe Grill. 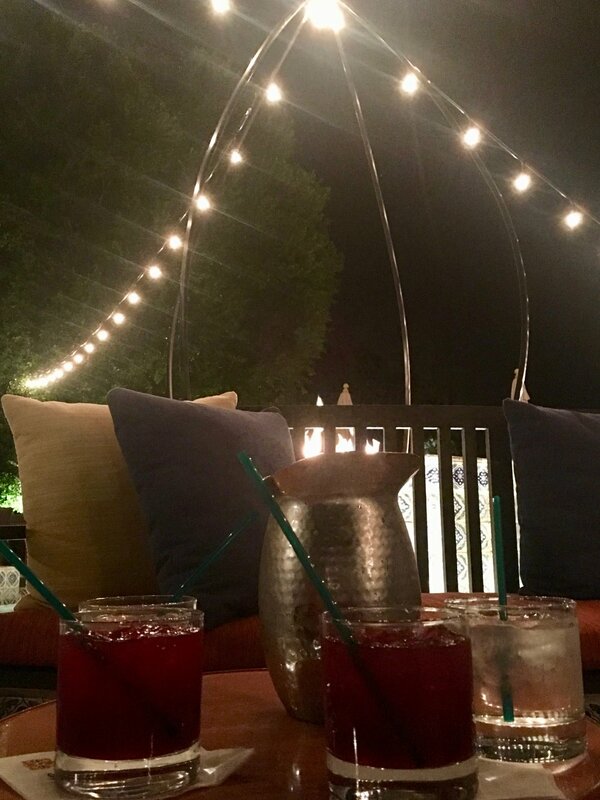 We sat under the stars and pretty patio lights, while sharing a pitcher of Sangria. The night air was warm and it was a perfect start to our weekend. Golf carts are a preferred method of getting around the La Quinta Resort & Club. We were told that any time we wanted a golf cart ride, we could just call up the front desk and someone would be over to shuttle us around the resort. After our sangria binge, we decided that it would be best to take them up on the golf cart offer. The resort is huge and our rather harrowing journey to our casita made it seem even more confusing. Our golf cart driver peeled out like he was racing in NASCAR and we narrowly escaped being lacerated by tree branches. He was nice enough, but we declined any further golf cart rides. 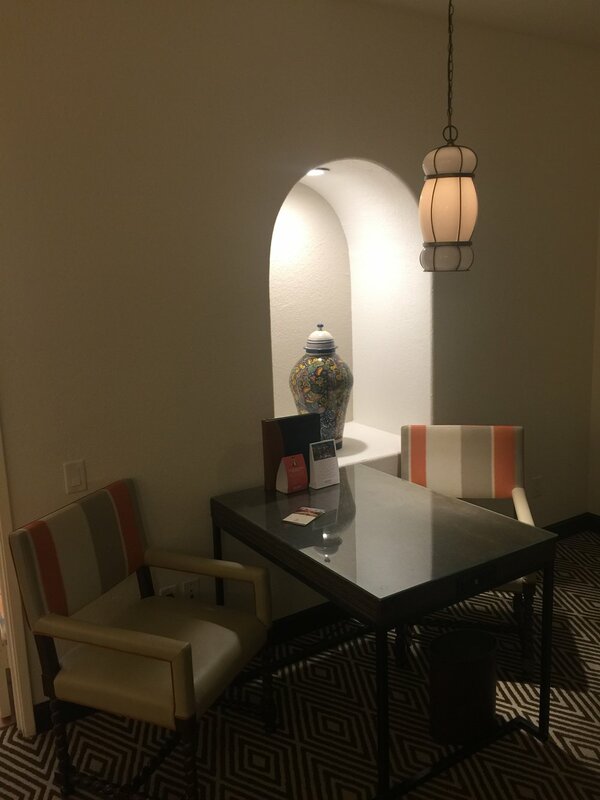 In the light of day, we realized that our casita was just a short walk to the main lobby and restaurants. 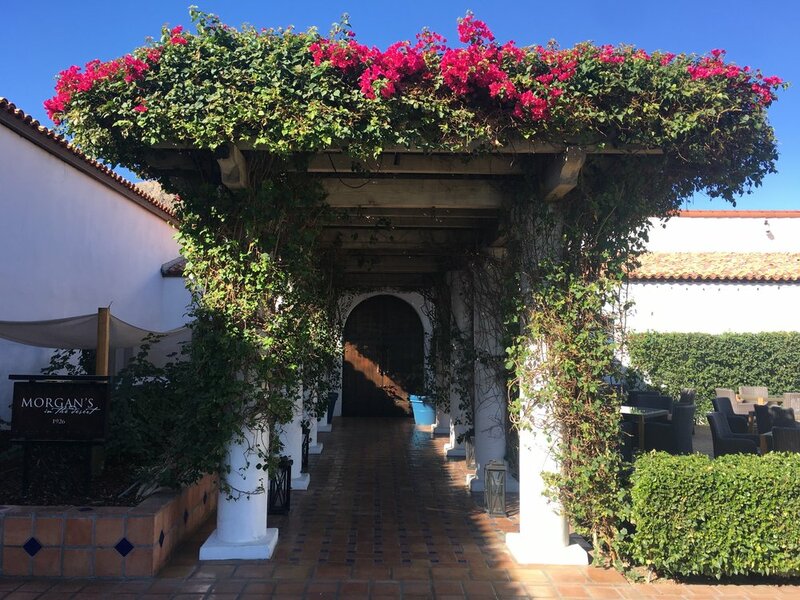 We were also able to retrieve our car from the valet and park it behind our casita, which was convenient on the morning that we checked-out. The La Quinta Resort & Club was built in the 1920's and many of the buildings are from the era. It was a popular place for celebrities and we stayed in the Ginger Rogers section. We didn't stay in Ginger Roger's casita, but we did swim in her pool! The La Quinta Resort & Club has forty-one pools. Isn't that heavenly? After sleeping in, we headed out in the sunshine and enjoyed the breakfast buffet at Twenty6, the resort's casual bistro located near the front desk. This was definitely an above average breakfast buffet experience, with attentive service and an awesome omelet station. They even brought us a surprise smoothie taster in a shot glass. Yum! Here are a few pictures we took of the resort as we walked to breakfast. After breakfast, it was time to hit the Ginger Roger's pool, which was located directly outside of our casita. I'm talking steps, a handful of feet. The weather couldn't have been more perfect. We spent a majority of Saturday poolside and on Sunday, we were granted a late check-out, allowing us to be at the pool until noon. We had the pool completely to ourselves for about 80% of the time. It was so calm and peaceful, that I was using the hot tub and a curious road runner came right up to me. It stuck around for about ten minutes and came so close, that I could have touched it. The Ginger Roger's pool didn't have a bar service. However, we were only a five minute walk from a bigger pool that did have a bar. We also could have ordered room service or brought our own drinks/snacks and stored them in the fridge in our room. We started basking in the sun and couldn't be bothered to go procure snacks or drinks. Our room had plenty of free bottles of water, important for staying hydrated in the desert. Golf and Tennis are two major activities at the La Quinta Resort & Club. We don't play either, but this may have been a reason why the pool was so quiet. 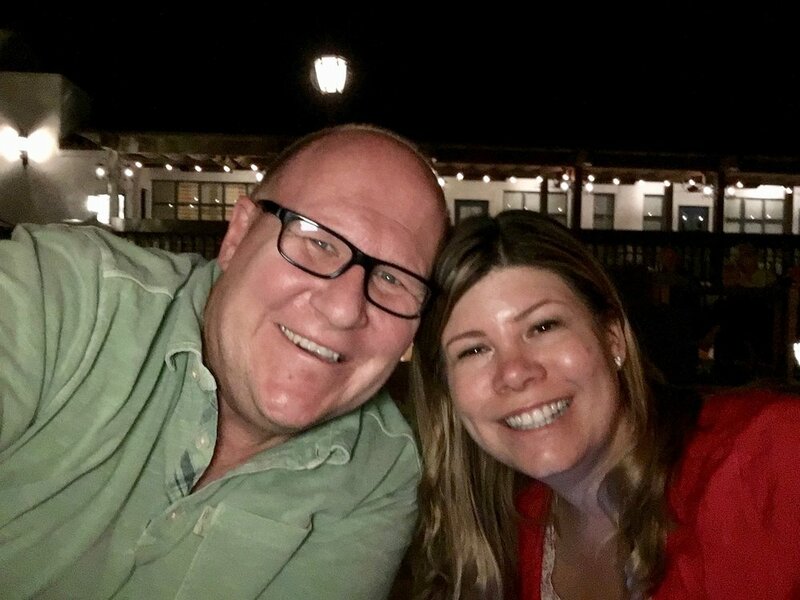 We truly had a magical anniversary getaway and we can't wait to return. 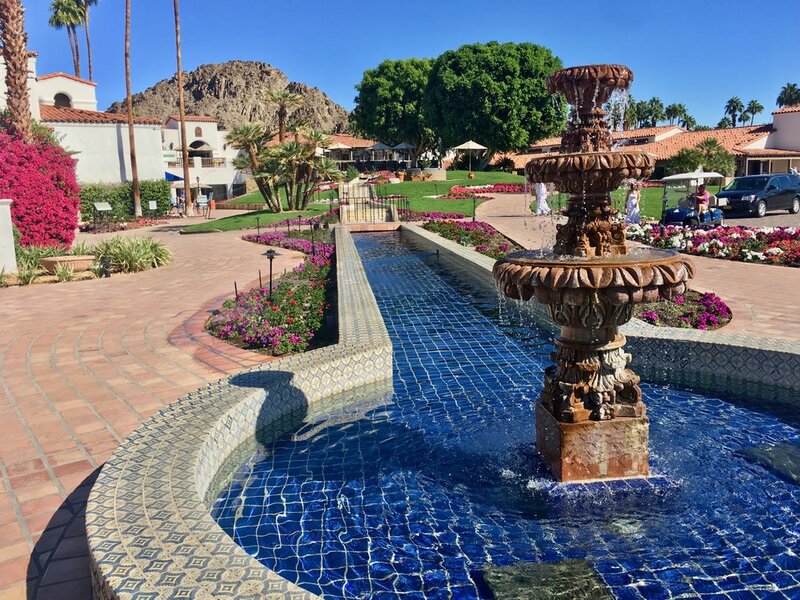 The La Quinta Resort & Club is a gem in the desert with old Hollywood glamour and a serene landscape. In 2016, before realizing that I prefer to go on vacations and write about my trips, I tried my hand at running my own travel agency. As I was learning the business, I was able to discover fantastic deals for our family vacation. 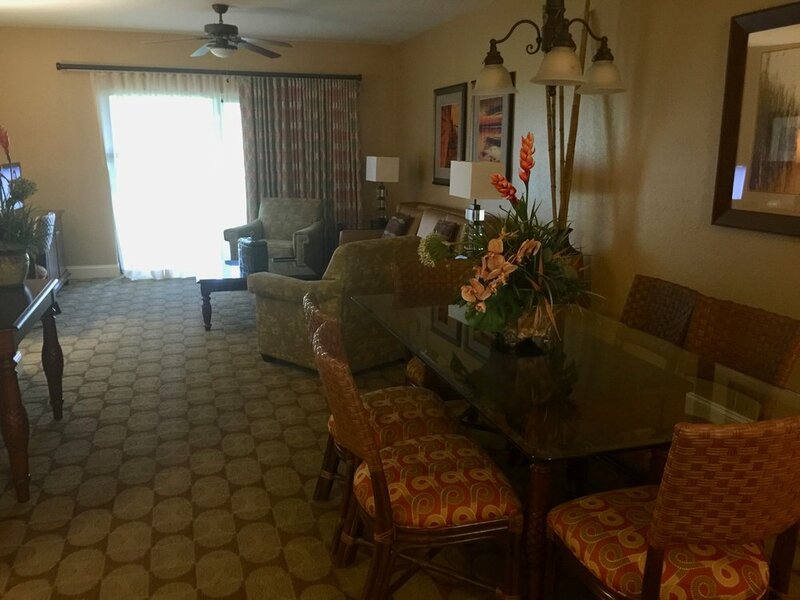 One of our discoveries was the Holiday Inn Orange Lake Resort in Orlando, Florida. We contemplated staying on Disney World property, as I have done on many previous trips. However, the high prices and lack of availability for our trip in late July/early August, made us look elsewhere. I don't think that the Holiday Inn has a great brand image, but we read reviews of the property and our price couldn't be beat. We got a two-bedroom condo for two weeks and a mid-size rental car for about 1600.00. No parking fees or other costly surprises. 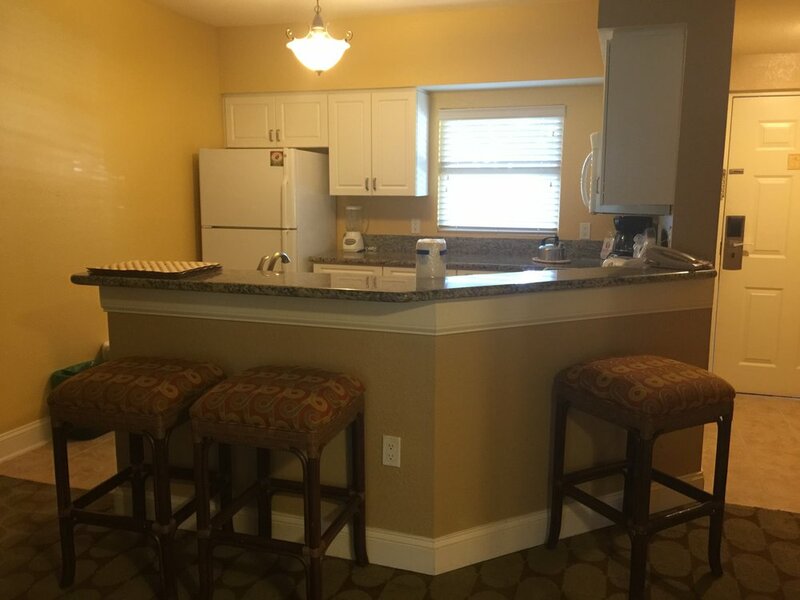 The resort is just a fifteen minute drive from Disney property and located very close ( practically walking distance) to restaurants, grocery stores, and a Target. We ate at several of the local restaurants, including a Bahama Breeze ( twice), a waffle house (twice), and the biggest hit with our family, Logan's Roadhouse. As a Disney fan I'm shocking myself by writing this, but I think I enjoyed our time off-property, as much as in the parks. There were a few catches to the incredible deal. The main one being that the Holiday Inn Orange Lake Resort is a time-share. We are not time-share owners nor was our deal contingent on taking a tour or sitting through a sales pitch. We simply booked an available room through my travel agency ( any agency can help you, I didn't have special access) and bundled it with our car rental. We knew it was a time share or "vacation club" going in and we had read advice on handling the time share employees from Trip Advisor. When we checked-in, we were directed to a separate desk to get our parking pass. This is the time-share ploy. We knew it was coming. We responded to the rather intense offers of checking out their vacation club, with a polite and firm, "No Thank You." We were offered the usual time share gifts, like park tickets and coupons for free inner tubes for the lazy river on property. They charge nine dollars a day per tube, so we just skipped it and honestly, the kids didn't mind. We read on trip advisor that we should unplug the phones in our room, because the time share people would try calling and sure enough, they did. However, with enough polite and firm "No's" they will leave you alone and we did not have this impact our vacation. Our family time is too precious to waste sitting through a presentation for something we are not going to buy in efforts to get a "free gift." Our room was located on the front entrance boarder of the property, on the top floor in a three story building. Some of the rooms are single-story bungalows. We had a large back balcony that faced a golf course that circled Orange Lake Resort. We don't golf, so this was another amenity that didn't matter to us. It looked nice if you are a golfer. I often sat on the patio to read and it was always peaceful with lots of local birds landing on our deck. I loved the patio. It was a good place for me to have a break, when everyone else wanted to watch television. The condo was perfect for the four of us. We had our own little kitchen that was fully stocked with everything that we needed to make meals at home. Although we often ate in the parks or out locally, we did have a couple of dinners in and we found that it was really helpful for breakfast. With little kids (6 and 9 at time travel), it was easier and cheaper for everyone to eat breakfast in the condo. We mostly used the breakfast bar for these quick meals, but the condo also had a beautiful dining room table. My Swedish stepkids wilted in the Florida heat, so we discovered that it was best to either go to the parks in the morning or late at night for just a few hours. This meant that we had plenty of time to enjoy the condo. The living room was perfect for watching movies and cooling off in the air-conditioning. This was the summer that we all discovered the show "The Impractical Jokers," which pretty much always seemed to be running in a marathon on TruTV. The kids had their own room and their own bathroom. They surprised us by unpacking their suitcases and putting their clothes neatly away in their bedroom drawers! Our master suite was down the hall and it had a large bathroom with a spa tub. The entire condo was spacious and comfortable. I actually enjoy doing laundry, even on vacation, so I was thrilled that our condo included a washer and dryer. It just made things a lot easier, especially when our clothes were gross from sweating and getting dirty at the theme parks. Lots of stains from dripping Mickey ice cream bars! One downside is unlike a traditional hotel, we did not have regular cleaning service. We could have had it for a per-day fee, but instead we just kept with the two cleanings that were included in our stay. We had to call to book the cleanings, but we found that they did a very good job. The lack of daily cleaning didn't bother me much, because we had the washer and dryer to clean towels and linens. We purchased an all-purpose spray cleaner and paper towels to keep sticky surfaces from getting mucky. It wasn't hard or a hassle to keep the room relatively clean ourselves. As I mentioned, the Holiday Inn Orange Lake Resort has a pool complex with slides and a massive lazy river. This was not near our room. The entire resort is enormous and it even has an internal bus system. We drove over to the pool complex and found to be over-crowded. On a slow day, it might be nice, but for our needs, the kids were more happy at the small, basic pool/hot tub that was located within walking distance from our condo. The pool close to our room was rarely crowded and it was just easier than having to haul ourselves over to the bigger pool area. As much as our family loves lazy rivers, no one was fussed about skipping this one and for a family of four, it saved us thirty-six dollars a day in ring rentals! We never went back and since none of us had a camera with us, we didn't take pictures of the big pool area. The resort website has great pictures if you're interested. Here is a shot of the pool near our condo. We used this every single day of the trip. A little Florida rain didn't stop the fun! The Holiday Inn Orange Lake Resort has many features we didn't visit, such as restaurants, arcades, kids activities, a gym...it has a lot to offer. Besides the initial pushiness of the time share people and the crowds in the main pool complex, we really had a fabulous time at the Holiday Inn Orange Lake Resort. The price simply cannot be beat and we loved our condo. It was convenient to the Disney parks and area shops/restaurants. It was the ideal fit for our family. 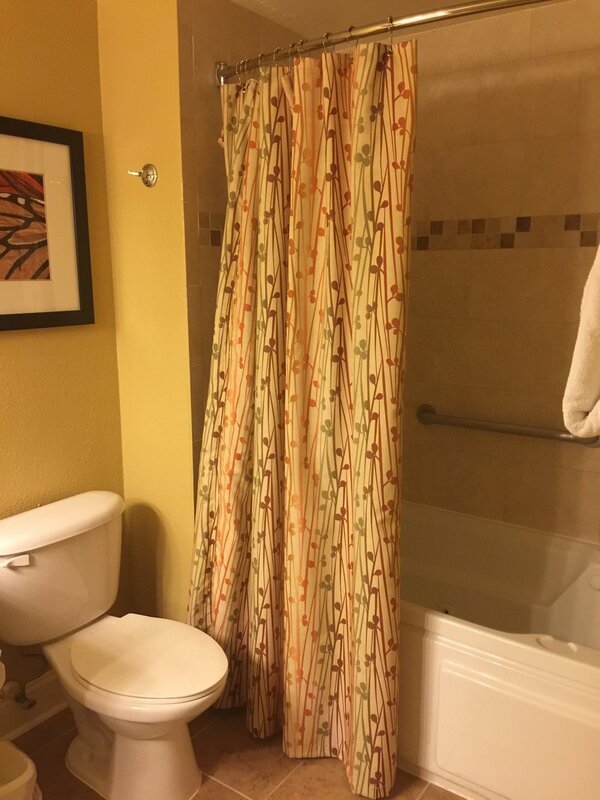 We would definitely return to this property and seek out other Holiday Inn Vacation Resorts.